I should have recognized an omen. A week later, carrying out the recycling, I managed to fall off the front two steps and land sprawling on the asphalt driveway. I lay on the driveway for about a minute, watching all the recyclables clatter down to the street. It was rather funny, because there were several one-gallon plastic milk jugs, and they looked so terribly joyful somersaulting and bouncing down the slope. I knew that this time I wasn't going to get away with the usual bruised knee or scraped hand, but still practiced complete denial and got up, gathered the recyclables, dumped them in the cart, and then went into the back yard to clean up after the dog, holding the shovel with the arm that couldn't move and raking with the good arm. The next day, the Resident Teen took me to urgent care, where my poor fractured elbow was put into a temporary cast. 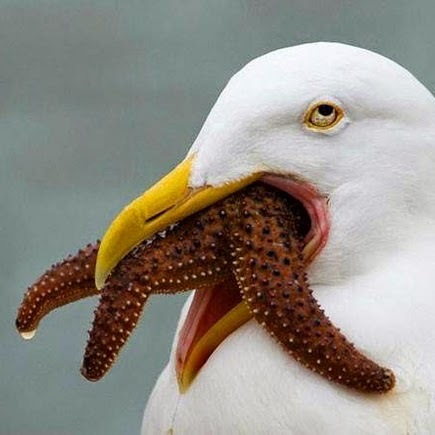 Came home with my arm in a stiff L-shape, my fingers dangling uselessly out the front looking like an unfortunate sea star being slowly digested by a gull. 1. Some things are really hard to do with one arm, such as opening childproof pill bottles, holding a cup of coffee while opening a door, holding a book and turning pages, chopping vegetables, squeezing toothpaste onto a toothbrush, folding towels, making a bed, keyboarding, tying shoes, fastening waistbands, buttoning a shirt (even putting on a shirt), blow-drying hair, clapping, opening envelopes, opening most packages of pasta and other foods, opening jars, using a manual can opener, and clutching your library books while picking up the one that invariably slithers out of the pile and falls on the floor. Among others. 2. People are really nice to you when your arm is in a sling. They will help you out and will usually tell you a broken-bone story of their own. 3. There are lots and lots of awful hand- and arm-related puns in the world. 4. A sling is a handy place to keep a cell phone. 5. You can buy shirts with Velcro-seamed shoulders for ease in dressing and instantly look more frumpy than you'd ever imagined. And a spinny-knob thing to put on the steering wheel of your car for one-handed driving. My advice: Watch your step!